Observatory, Small Observatory, and Auditorium, University of Illinois. Photo credit: University of Illinois Archives. If you’ve been looking for the online version of the excellent National Historic Landmark Theme Study on Astronomy and Astrophysics by the National Parks Service, you should know that most of the NPS links to the title page are broken. You can find the portal to the e-book at http://www.nps.gov/history/history/online_books/butowsky5/astro.htm (not at /butowsky/index.htm as the failed links would have you believe). The book is rather dated (1989), and the information included in it is most comprehensive for the observatories and instruments that have been nominated for National Historic Landmark status, but even the briefer entries are useful for dates and locations. 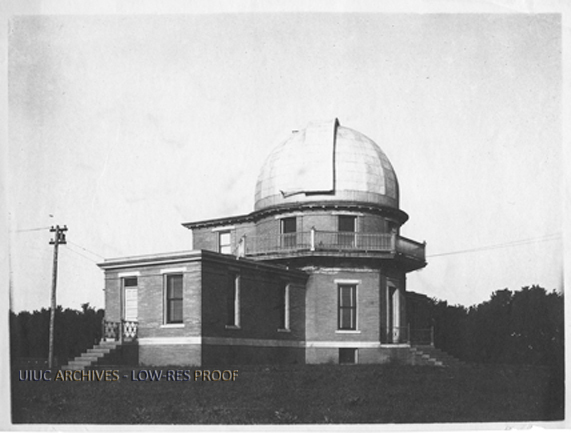 I was happy to read the nomination entry for the observatory of my alma mater, designed by architect Charles A. Gunn in 1896. 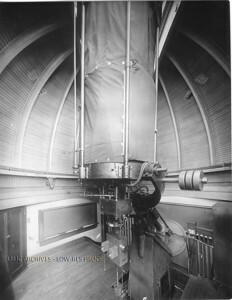 University of Illinois Observatory. Photo credit: University of Illinois Archives. 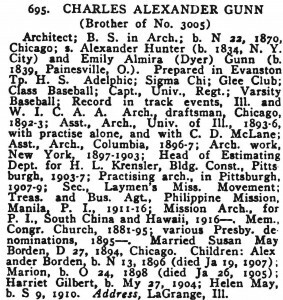 It took me a bit of effort to track down Mr. Gunn, but according to the 1914 Alumni Record of University of Illinois, he was born in Chicago in 1870. He appears to have been a very well-rounded individual: at university, he was in Adelphic, Sigma Chi, and Glee Club. He was Captain of his class baseball team, played varsity baseball, held the state and conference record for the ball throw, as well as the Hop, Step, and Jump, and broke the university record for the running broad jump in 1890. 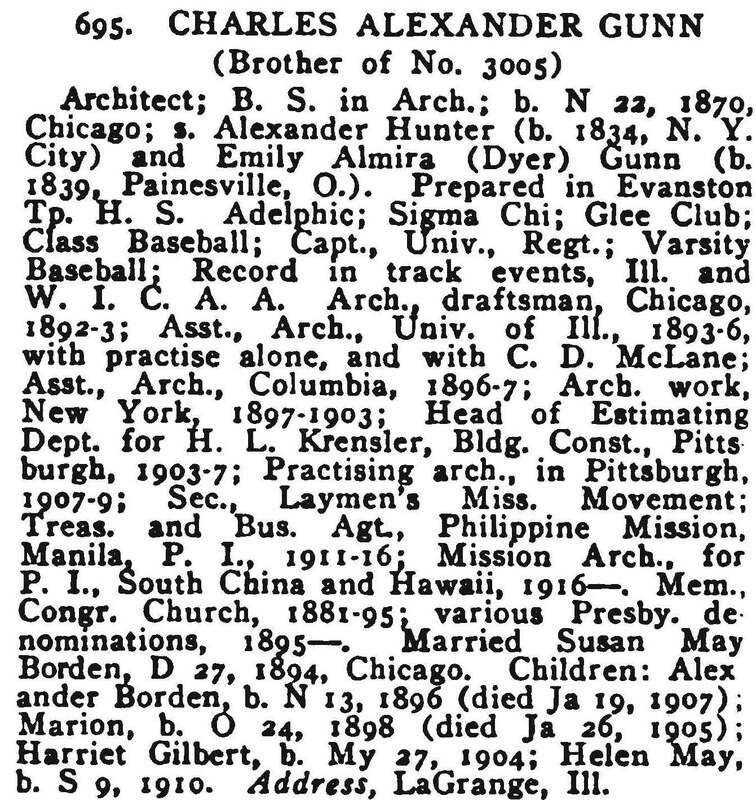 Charles A. Gunn, Entry from 1913 Alumni Record, University of Illinois. 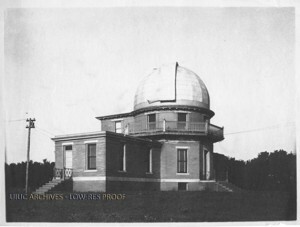 It would seem Gunn designed the observatory as one of his last projects in Illinois, as he was recorded as working in New York between 1897 and 1903 (first as Assistant Architect at Columbia University, second as a solo act). Charles Gunn, Entry from Semi-Centennial Alumni Record of University of Illinois, 1918. I’m not quite sure when Mr. Gunn got religion, but two of his children died young, in 1905 and 1907, so maybe he sought solace in the church after those events. 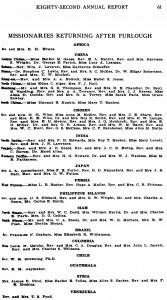 At any rate, The Eighty-Second Annual Report of the Board of Foreign Missionaries of the Presbyterian Church of the USA (1919) notes that Mr. and Mrs. Gunn had returned to the Manila Station on the island of Luzon with the Philippine Mission after furlough. 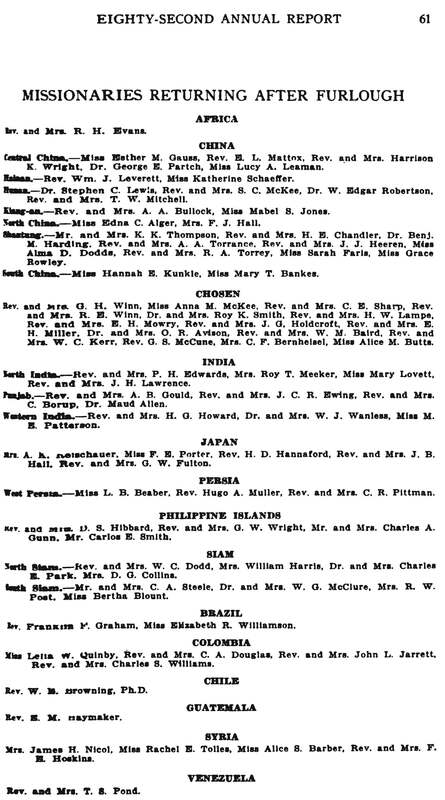 Eighty-second Annual Report, Foreign Missions, Presbyterian Church USA. Eighty-Second Annual Report, Presbyterian Church USA. But when did the Gunn family returned to mainland U.S.? Mr. Gunn continued to work in the Philippines, South China and Hainan from 1916 to 1921, after which point he worked in Shanghai until 1939 (see, for instance, the Missions Building, 169 Yuanmingyuan Road). He made the national U.S. press when hostilities between China and Japan came to a head in 1937 (“Daughter Fears for Parents in Peiping Mission,” Chicago Daily Tribune, July 31, 1937; “Charles A. Gunn.” New York Times, Oct. 20, 1945), but I haven’t been able find any trace of him after that year. It would seem, however, that the observatory was a one-off, and his true calling was in the architecture of religion, not science. 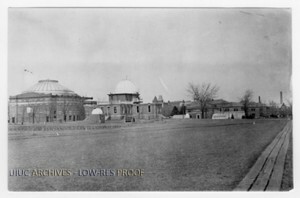 For more information on the observatory, including plans to restore the space, check out the Facebook group, Friends of the University of Illinois Observatory (thanks, Mike! ).